Many people will have a new (or used) ukulele sitting in their house, either received as a gift or bought by themselves. As a proud new owner of a ukulele myself, I straight away headed online to find the best ukulele resources for new owners. Thankfully there are some great destinations on the Web to help new and experienced uke players alike. The ukulele is considered the easiest stringed instrument to play. With just four strings the ukulele has an incredible range of chords but only a few which are essential to learn in order to produce music. Ukuleles are therefore a good entry-level instrument for those who want to play guitar or another stringed instrument, but don’t have the confidence to start on something so complex. Ukulele Tuner is first on the list as tuning your ukulele is the first thing you’ll need to do. Get-Tuned offers an online ukulele tuner which is simple yet very effective. You get a choice of five presets, including standard, full step-up, and full step-down, as well as a complete set of notes to choose for yourself. You can also choose between a ukulele sound and a sine wave depending on your preference. Get-Tuned also has tuners for guitars, banjos, violins, and other stringed instruments, articles such as introductions and how-to’s pertaining to these instruments and even a Java-powered virtual metronome with different sound effects and tempo options. Uke School, or Pineapple Pete’s Uke School to give it its full title, is a great place to head after your new instrument is tuned to perfection. The bulk of the site is dedicated to simple and intuitive lessons broken down into Beginner, Basic, and Advanced, and further into individual drills and instructions. The lessons are perfectly pitched, being easy to follow and detailed. There is also a section talking about the ukulele, including the types available and the history of the instrument, a section featuring songs, and even a section dedicated to getting babies playing the ukulele. The site is free to use thanks to unobtrusive advertising and a donation page. Ukulele Underground exists to help the next generation of ukulele players, dispelling the notion that the instrument is just a toy. There are lessons and tips presented in the form of videos, and even the occasional video collaboration by members. There is also the opportunity to form or join a group, and to read or contribute to the forum. The basic lessons are free, again supported by advertising and the chance to donate. There is also a paid option called UU+ for those who can afford it. This offers more-detailed lessons, live seminars, downloads, and giveaways. 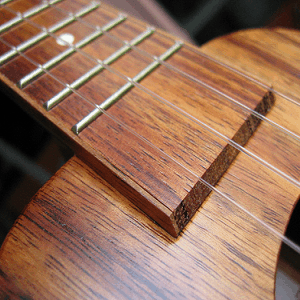 Easy Ukulele is another site built for newcomers to the instrument. There is a wide range of content on the site, from tips for tuning and strumming right through to video lessons and chord charts. The passion the site’s owner Kainoa has for the instrument is obvious and empowering, and it makes it a lot easier to listen to what he has to say on the subject. As well as the lessons there are also reviews of different ukuleles, basic information on uke musicians and festivals, and links to a multitude of other websites ukulele players will find useful. Ukulele Songs is the place to visit after you have learned the basics and want to do more with your uke. There are pop songs available to play, with all the chords needed to perform tunes from ABBA to U2 all laid out neatly. There are also videos and chord charts. Worth it simply for the tablature needed to play The Wind Cries Mary by Jimi Hendrix. Uketoob isn’t quite worthy of a full entry on this list, but it’s a fantastic site nonetheless. It isn’t a resource as such, instead being a ukulele video blog, featuring a new clip which includes a uke or ukes on a daily basis. But it’s a must-visit for all ukulele players both new and experienced. These five fantastic ukulele resources on the Web will provide new and established ukulele players with tips, tricks, chords, tabs, lessons, and much more besides. If you play the ukulele then please feel free to share other (preferably free) resources you have found on the Web. If you don’t play the ukulele then why not? Do you prefer another instrument? Do you think the ukulele is nothing more than a trendy toy? The video embedded above should hopefully help dispel that myth. UkuleleHunt is awesome, and that video is a great first port of call for complete novices. Thank you for taking the time to pass those on, sincarne.